GEOTRANS provides measurements of Bus advertising audience in metropolitan areas. The Audience data can be integrated with software provided and developed by CUENDE Infometrics (Quantum, Monitor Ooh, Patrimonio AOL) as well as planning software of other companies such as Tom Micro. The integration of criteria in GEOMEX allows media planners to know reach, OTS and GRP of their advertising campaigns. In order to obtain the data on the journeys made by people in metropolitan areas, a survey was made through personal interviews using tablet PCs, digital cartography and software developed by CUENDE Infometrics. With this data, the most likely journeys were calculated on the basis of frequency and/or habits of each individual. At the present moment A-GPS devices are used in order to collect fieldwork data. The exact location of the urban bus fleet was achieved through GPS devices. 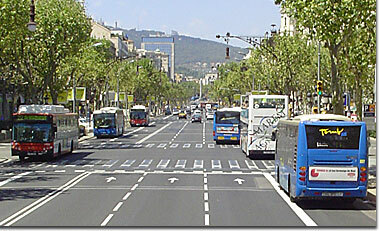 The probablity that someone sees a bus depends upon the time of that person is on a specific street block (also known as stretch) and the bus passing by that same stretch at the same time.When the coincidence between bus and individual exist in time and space, then a visibility analysis should be taken to check if there is an opportunity to see (an impact). The concept of the research is very easy to understand and so it is, even though the development was very complex.